The Discovery Channel's documentary series is going high-def at the end of the month. 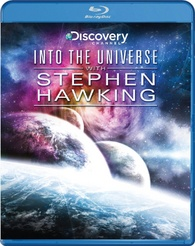 In an early announcement to retailers, Gaiam Americas says 'Into the Universe with Stephen Hawking' for Blu-ray on January 31. In an epic, new kind of cosmology series, 'Into the Universe With Stephen Hawking' gives us the ultimate guide to the universe. From the nature of the universe itself, to the chances of alien life and the real possibility of time travel, watch the world's most famous scientific mind at work through the limitless possibilities of computer animation. Specs and supplements still haven't been revealed yet, but suggested list price is $14.98. You can find the latest specs for 'Into the Universe with Stephen Hawking' linked from our Blu-ray Release Schedule, where it's indexed under January 31.